If a walk out on the Pier with your family was a Thanksgiving family ritual, you might want to pass this year. The City has closed the Pelican Parking lot (south side) at the base of the Pier approach. Until this week, the lot was open for those wishing to stop by and watch the inverted Pyramid come down and for the few fishermen who are regulars on the parking lot sea wall. 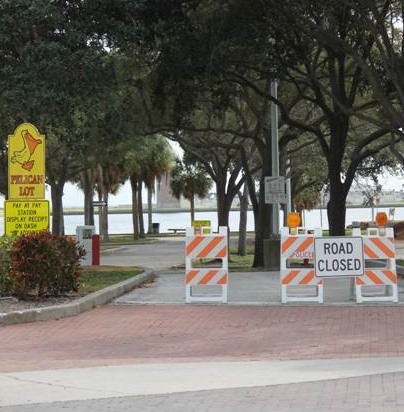 It is unclear at this point if people are prohibited from the parking lot and sea walls. I have been stopping by regularly for the last month or so as the pier demolition proceeded. It was surprising how many people would drive through the parking lot stop and take a few pictures. Many would just stand and look while shaking their heads. A few tears were not uncommon. The inverted pyramid is now totally gone. There have been some issues with turbidity barriers and navigation lights other than that, things seem to be going along as planned. The Pier deck will be dismantled next, and then the approach will be removed. These are big jobs and as we approach fall and winter, the Northeasterly winds could cause a few problems. If you're planning on going down and want to walk out on Spa Beach for a closer look, be sure to park on the street or over in the North lot which is still open. If a walk out on the Pier with your family was a Thanksgiving family ritual, you might want to pass this year. Thanks to the Kriseman administration it's really just a sad sight with some remaining rubble and demolition equipment. Very friendly guys came by and hauled away all the furniture I couldn't sell before I moved. They actually showed up a little too early because the movers were there, so they said they'd come back a little closer to the appointment time. Very accommodating, so they are environmentally of Chicago demolition conscious. Also reasonably priced!